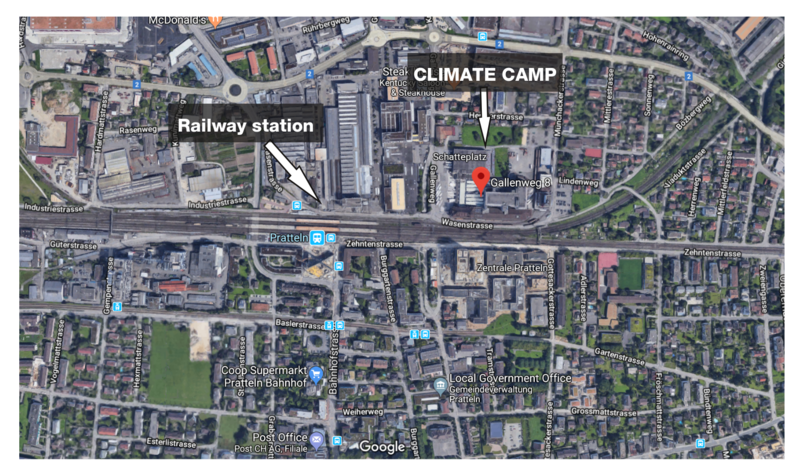 Our Climate Camp is located next to the railway station in Pratteln (Baselland) at the Gallenweg 8. We are looking forward to meeting you soon! 13:00: Common journey to the camp from Basel: Meeting point: de-Wette Park, Elisabethenstrasse 45, 4051 Basel. Join us on the way to Pratteln where the camp will take place! We will get there by Bike or by train! 14:00: Building up the camp in Pratteln: Togheter we will buil up our Camp! Meeting point: Area „Zentrale“ in Pratteln, Gallenweg 8, 4133 Pratteln, right next to the railway station. 16:00-18:00: Common Ground: An exhibition of “Ways out”: The “Common Ground” is an afternoon of getting together, networking and an opportunity for different groups, all working towards social, economic or environmental change, to get to know each other. It is a platform to learn from each other, to connect our struggles and to build a basis for working together more closely in the future. During the Common Ground you have the possibilities to present your projects to a bigger audience, to encourage new people to engage with you and to let others learn from your experience and expertise. We from the climate camp and the climate games are looking forward to learning from your knowledge and to build on your experience. How can I safely and effectively block a street, gate or intersection in a direct, non-violent action? What actually are lock-ons and so-called “Tripods”? What can you use them for and how to most skillfully handle them? In the beginning of the workshop, all participants will decide together which of the three topics tripods, lock-on’s or actions on the water are the most exciting for the group. This follows a brief, rather theoretical introduction to the operation and scope of these blockade techniques, and afterwards they are tried out and practiced together. 14:00-15:30: Open Space: You and /or your group have always wanted to design a workshop and make your knowledge available to an audience? You always wanted to discuss a burning issue with other people and exchange thoughts? Or you just want to dream together about the future? Then the open space is the exact right place for you! Contact us at info@climategames.ch or directly at the camp with your idea and we will complement the program on an ongoing basis. 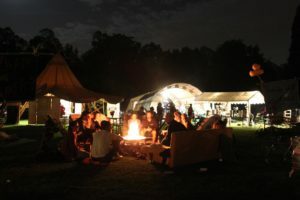 We communicate your workshop at the camp and try to mobilise people for it. Be there and contribute! 16:00-18:00: Workshop with Rudolf Rechtsteiner: Nuclear power does not save the climate! How does a 100% renewable energy system work? In den letzten Jahren sind Solarstrom und Windenergie immer billiger geworden und befinden sich weltweit auf einem Siegeszug. Aber woher kommt der Strom, wenn die Sonne nicht scheint und der Wind nicht bläst? Und wie erreichen wir eine Mobilität ohne CO2-Emissionen? Wie lässt sich heizen, ohne dass die Klimaerhitzung weiter ansteigt? Diese und weitere Fragen beantwortet und diskutiert der Basler Energieexperte und frühere Nationalrat Rudolf Rechsteiner. Scientific consensus and global decision: In order to avert worse climate crises and human rights violations, we must completely revamp our current economic system. Zero oil, zero gas, zero coal, zero land degradation and deforestation, zero animal-based agriculture – everything that causes greenhouse gas emissions must stop. But how do we manage the turnaround? Politics and business continue as before – as if there were no zero emissions targets. Obviously, there is no pressure from civil society. How do we strengthen the climate movement for the political turnaround? Georg Klingler, campaigner at Greenpeace Switzerland, presents the plans for a broadly based so called “glacier initiative” and wants to discuss with the participants in the discussion how we can turn a vision that is insignificant for Bern into an assertive climate movement. 11:00-13:00: Action training: How to do a small group action? Which (also low-level) small group actions are possible? How can such an action take place and which tasks are there? The workshop will share skills to plan your own actions. Every day, decisions have to be made in groups. In many cases, decisions are taken by majority vote without weighing up the advantages and disadvantages of this method. An emancipatory alternative is consensus: the art of joint decision-making. Concerns and needs are all heard to make the best decision for each individual and the group. During the workshop, the consensus-finding process is explained to the participants in a theoretical and practical approach. For this we will reflect about: decision-making in groups as well as the framework conditions, the moderation and the hurdles of consensus decisions. 20:00-22:00: Workshop with Axel Schubert: „Eco“ guidelines as unjustified ideologies: A Criticism of Sustainability & Co.
Action in relation to the „eco“ crisis has been announced since the 1970s. But why is there a real trend reversal missing? For this purpose, some of the common „eco“ images are criticized: Are they part of the problem? Are they maybe even stabilizing a non-sustainable world? It is explained what the prevailing approaches to sustainability, the „City of Short Paths“ and the „2000 Watt Society“ have an unjustified ideological character – which at the same time calms us down and depoliticizes us. What would it take for the mission statements to be conceptually conclusive? What does this mean for our everyday life, e.g. in the field of mobility? How can we rebuild our society instead of continuing to distract ourselves with feel-good labels? Input and subsequent discussion with Axel Schubert, city planner, sustainability critic, with experience in urban „environmental“ movements, planning administration and academic work. The climate catastrophe is a global matter that knows no borders. In this sense, it is important that the various movements connect their struggels and fight together for a good life for all. A rough overview of many actions & climate camps, that have taken place and are yet to come, will show how broad and diverse the climate justice movement is. The network CJA (Climate Justice Actions) from various small movements will present the campaign „by2020weriseup“ and invite you to think along, to discuss and to get active. What is the collaborative economy? And how can community-based approaches, originally from social work, be used to change our society? The input and the following discussion will outline how it is possible to work for the transformation of our economic system. Manuel Lehmann is the founder of “Thinkpact Zukunft” and co-founder of “Transition Zürich” and the “Ernährungsforum Zürich”. His book „Kollaborativ Wirtschaften“ was published by oekom, the largest publisher of sustainability in German-speaking countries. Successful and safe actions require good preparation. Action trainings are therefore a central preparation tool, so we have invited action trainers from the network Skills4Action to discuss with you: How do I behave in stressful situations, how do I keep track and what is an affinity group? What options are there to decide together in a stressful situation and what do I need to know before I participate in an action of civil disobedience? Come to the action training and get new skills! The program is continously updated.